Conveniently located in Central PA, the area is easily accessible to Interstates 80 and 81, Routes 11, 15, 45, 192, 61, and many others. The Susquehanna River Valley is made up of three counties in Central Pennsylvania - Snyder, Union, and Northumberland Counties. 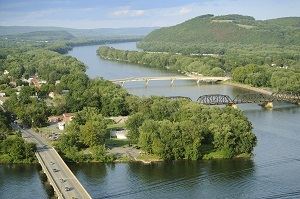 Though the Susquehanna River runs throughout the Commonwealth of Pennsylvania, we define the Susquehanna River Valley as the geographic area where the two branches meet. This is something unique only to our area and the three counties that border the confluence. The Susquehanna River Valley not only includes the river but all of the scenic valleys and country-sides that make the tri-county region an attractive place to live. The Susquehanna River Valley is thriving downtowns and scenic country-sides. Our welcoming nature, along with our gorgeous scenery and year-round events, make the Susquehanna River Valley the perfect place to live and visit. Here in the River Valley, you'll notice that we enjoy sharing the road with buggies and bicycles; that fairs and festivals highlight our rich history and heritage; and that the arts thrive in our galleries, museums, parks, and small cafes. Opportunities abound to shop in historic downtowns and one-of-a-kind shops. It won't be hard to find whatever you're looking for, including jewelry, art, fresh produce, homemade delicacies, clothing, antiques, furniture, quilts - and so much more. 2 malls and numerous shopping plazas are also easily accessible. Whether you’re looking for a romantic dinner for two, Happy Hour specials for a group of friends, or a family-style home cooked meal, the Susquehanna River Valley has it. Many of our restaurants and chefs use locally grown ingredients to give visitors a taste of the Susquehanna River Valley’s seasonal offerings. Whether it’s spring, summer, fall, or winter, the natural beauty of the Susquehanna River Valley is sure to inspire you to take in the great outdoors. Not only is the Susquehanna River Valley home to the majestic Susquehanna River, we are also surrounded by state parks, scenic country roads, abundant fishing streams and year-round recreational opportunities. There’s truly something here for everyone – whether you like to hike, bike, fish, canoe, golf, watch wildlife, or take a leisurely stroll through a park with friends and family – it’s all right here for you to enjoy! The Susquehanna River Valley is home to Bucknell University, in Lewisburg, and Susquehanna University,in Selinsgrove. Both are located in thriving downtowns and offer Lifetime Learning Experiences, sports and recreation, and arts & cultural opportunities. The Lewisburg Garden Club was established in 1948. Our purpose is to stimulate interest in and promote knowledge about gardening, to aid in the protection of trees, plants, birds and scenic beauty and cooperate in beautifying public surrounds. Community Center that offers fitness programs, sports, senior programming, youth programs, summer camp and a variety of special events. Integral Yoga is an ancient, cohesive style that addresses the whole individual: body, mind, emotions and spirit - allowing health, joy, peace, and fulfillment to be experienced on a daily basis. We offer weekly classes in Level 1 and 2 Hatha, chair and yoga for cancer patients, survivors and caregivers as well as specialty programming for mood management, meditation, children, etc throughout the year. Throughout the Endless Mountain Music Festival concert season, experience a 60 piece orchestra on the weekends with chamber music during the week. Free concerts for children make the festival a family destination. Visit our website for more details. 1949 Art Deco landmark containing artists' studios, bowling alley, community kitchen, developing historical museum, and more. The new heartbeat of Bloomsburg's downtown. Come on in! Founded in 1988, the Stadler Center for Poetry is a literary center offering a wide range of programs and residencies for emerging and established poets and writers for 25 years. A law enforcement chauffeur, limousine, and executive car service. Blue Line Secure Transportation Services is a new type of limousine service unlike any other in the area. We can drive you in your corporate, private or rental vehicle or you can choose from our fleet of luxury chauffeured limousines – and they are all driven exclusively by veteran police officers. Every time you use our service you can be sure that you are in safe hands. Whether you’re seeking luxury car or limousine service to the Philadelphia International Airport, Harrisburg International, or LaGuardia, a convention, an important meeting or a special event, our experienced chauffeurs know how important it is that you arrive on time. We strive to ensure prompt, reliable service by a courteous, professional law enforcement chauffeur. Blue Line Chauffeurs also provides transportation for personal events and special occasions, including weddings, proms, bachelor & bachelorette parties, wine or brew trail tours, honeymoons, sporting events, and transportation to and from the airport and ports for cruises. Quality healthcare to our community has been Evangelical Community Hospitals mission since our founding in 1926. We have grown with the needs of the community, providing comprehensive health services that are high quality and compassionate. Excellence every day. Sunbury Community Hospital is your community healthcare provider; a 118-bed facility offering a range of services including inpatient, outpatient and emergency care, as well as medical and surgical care. We believe in the power of people to create great care. We're more than 40 healthcare professionals strong. And we work hard every day to be a place of healing, caring and connection for patients and families in the community we call home. Jan 18.2 F° 26.2 F° 34.3 F° 2.9 "
Feb 20.3 F° 29.3 F° 38.3 F° 2.5 "
Mar 27.4 F° 37.6 F° 47.7 F° 3.2 "
Apr 37.6 F° 49.3 F° 60.9 F° 3.6 "
Jun 57.0 F° 68.3 F° 79.5 F° 4.5 "
Jul 61.4 F° 72.5 F° 83.5 F° 4.0 "
Aug 59.5 F° 70.6 F° 81.7 F° 3.8 "
Sep 52.2 F° 63.2 F° 74.3 F° 4.2 "
Oct 40.4 F° 51.6 F° 62.8 F° 3.5 "
Nov 32.1 F° 41.3 F° 50.5 F° 3.6 "
Dec 23.4 F° 31.2 F° 39.0 F° 3.0 "
Our homes are nestled within a beautiful park like setting. 54-acre campus with walking paths, outdoor gazebo, a bocce ball court to name a few. 2 or 3 bedrooms, sunrooms and garage options, affordable luxury that is maintenance free. Our environment is designed to encourage friendships, connections and wellness with daily opportunities to engage in stimulating activities, both on campus and in town. We are dedicated to helping seniors stay in their homes as they age. Our CAREGivers are screened, trained, insured and bonded to provide non-medical care including personal care, companionship, housekeeping, and respite care. 1977-2007 represents over 30 years of excellence in retirement and senior care. Situated on 105 acres, in Northumberland, we offer spacious retirement homes, retirement and personal care apartments, memory care, rehabilitation and nursing care. Independent living apartments with all appliances and maintenance free. Weekly trips to Weis Market. Monthly Bingo and Birthday Parties. Lots of Activities. Close to Susquehanna Valley mall and "The Strip" in Selinsgrove. As a not-for-profit organization, RiverWoods Senior Living Community fulfills a ministry of caring by encouraging wellness and independence through all levels of care, including independent living apartments and cottages, personal care, and short-term rehabilitation and skilled nursing. The Union-Snyder Agency on Aging is your one-stop resource for Aging Services. Regardless of one's economic level the Agency on Aging is available to provide information and programs for seniors. Please call for more information. A locally owned in-home care agency, offering peace of mind to seniors and their families. Our thoroughly, screened, experienced, bonded and insured caregivers provide non-medical personal care, meal preparation, homemaking, and respite care, short-term to 24/7. Winner of The 2016 Best of Home Care Leader in Excellence Award. Only four other agencies in PA and 55 in the United States earned this award. Visiting Angels of Lewisburg is now ranked among the best home care providers in the nation. VOICE (Volunteer Opportunities in Community Endeavors) is a coalition of organizations and agencies whose mission is to promote, develop and strengthen the role of volunteerism in meeting community needs. VOICE has an extensive list of organizations that utilize volunteer time, talents and expertise. VOICE is a founding partner of the CommUnity Zone. Open Tuesday through Friday, 2:00-5:00pm, and for special events. Mission: To create a place where all members of the community and organizations that serve them share ideas, talents and resources that contribute to vibrant, caring and connected communities. To grow the capacity of individuals and organizations to create significant positive change by enhancing their professional abilities, developing their life skills and confidence, and encouraging their creativity, entrepreneurism and collaboration.